"On a typical Northwest Washington coastal day in winter, the colors are `green and grey` with white highlights." Artist comment: "If you have spent any amount of serious time on the northwestern coast of Washington State, you have no doubt experienced the overcast days that are so famous here in the winter months. Some may call them gloomy, some may call them depressing, some may feel sad. I LOVE it here in the winter! My favorite color is grey! I am invigorated by those kind of days! I have also discovered that not all is grey. There can be lovely greens, warm browns, vivid whites, and occasionally blue, red, yellow and more. I paint those circumstances too. As an artist, I choose my subject to paint. I am happy to depict with oil on canvas, the grey, overcast days that are so much a part of my existence. So, if you, too, feel that way, this painting is right for you." 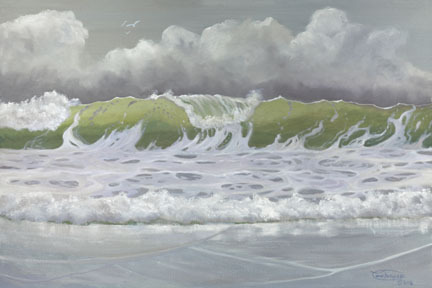 "Green And Grey" is a limited edition, giclée print from an original oil painting by Carol Thompson. The edition includes 3600 authorized, signed, limited edition prints (3500 numbered and 100 artist proofs). Release date is May 2016. Image size and substrates vary. All prints are signed and numbered by the artist and include a certificate of authenticity. Paper prints are shrink wrapped on foam board. Canvas prints are coated with a protective spray.